On Friday, March 15 at 6:30pm, Studium West will feature author Glynda Peterson Schaad discussing the story of a “woman to reckon with” from our local history. “Confluence of Cultures: the Story of Pansy Ann Martin”, is cast in the 1880-1910 era, and was labeled the “Period of Readjustment” by Indian agents for coastal tribes. Scholarly observers of this time have been substantially less charitable, describing these years as “The Dark Decades”, “The Lost Years”, or in the words of George A. Pettitt, “… people living rather dazedly in the ruins of their culture.” There were, however, survivors. 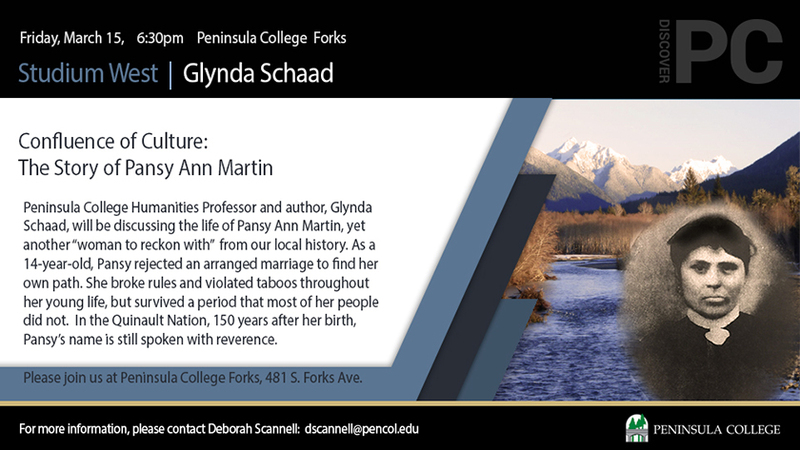 Schaad’s presentation will celebrate the life of Pansy Ann Martin who, as a 14-year-old, rejected an arranged marriage to find her own path, first as a runaway and outcast of her village, then as the wife of a British immigrant/mountain man. In her young life Pansy broke rules and violated taboos, but survived a period that most of her people did not. In the Quinault Nation, five generations and a century and a half after her birth, Pansy’s name is still spoken with reverence and respect. Studium West is a free monthly lecture series at Peninsula College Forks, located at 481 S. Forks Ave. Research for this presentation has been a collaborative effort by the Peterson siblings: Stan Peterson, Gary Peterson and Glynda Peterson Schaad. It will be featured in their new book, Women to Reckon With: Daughters of the Wilderness, expected to be released in late 2020. For more information, contact gschaad@pencol.edu, or call 360-374-3223.